He showed me his bowl. It was beautifully proportioned, made of beaten bronze, smooth, without decoration, It was surprisingly large, for I estimated it would carry around four litres. The base was rounded and the sides filled out, then narrowed at the top so the mouth was less broad than the belly at its widest point. He showed me how this enabled a special lid with a two inch edge, to be easily slipped on. “It keeps the flies out, and the heat, if it has to be carried a long way,” he said. “Why is it so big?” I asked. He put the bowl down in front of us and I saw that to enable it to rest upright it was attached by intricately woven webbing to a basketware base. This in turn was attached to a broad plaited cord strap so he could carry it over one shoulder. I noticed that all the other bowls, as well as the webbing and basketware the other monks were carrying, were identical. I sat awkwardly in front of him on the ground as he arranged himself and his robe so he could sit with his legs crossed in the lotus position, bare feet tucked into each other, knees flat on the ground in front of me, not stuck up as when one sits crosslegged. To my surprise he looked entirely relaxed and comfortable, and unlike me he did not seem to find it necessary to keep on shifting about on the concrete floor. “Well, no John, it is not a begging bowl. That is what the missionaries called it as a way of trying to demean what is done here. In fact we are not allowed to ask for anything, let alone beg. 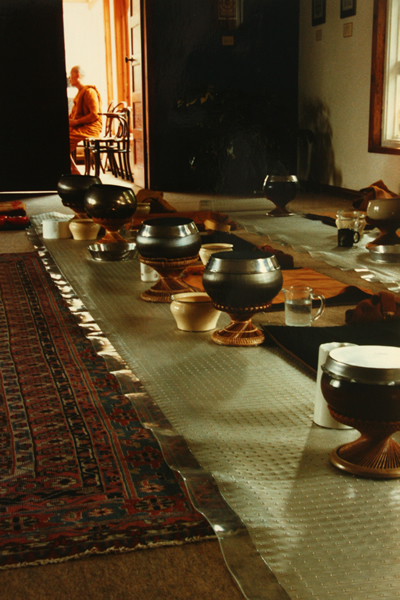 The rule for us is, “Do not take what is not freely given.” This bowl is for receiving the freely given gift of food, without which our monastic life as preserved in this Therevadan tradition is impossible. “No,” he replied. “They are not begging. They go where they know they will be welcome, often to members of their own families who you will see lined up and expecting them with bowls of rice and other cooked food, for to support those who are undertaking the Buddha’s system of training is considered a most valuable act of generosity, and practicing generosity, free will giving, is the first practical step on the spiritual life for everyone. In fact the Buddha decreed that no food may be grown or prepared by us monastics. This was to insure they we always remain totally dependant upon the generosity of householders or the lay community around us. They provide everything for the monastery so when we practice the Buddha’s teaching, we always do it with a sense of gratitude for the very real sacrifice of the families around us. In rural Thailand for two millennia the practice has been for a number of monastics to set off on an alms round early each morning before the heat of the day. They are silently and respectfully greeted with raised hands by the villagers, the “householders”. The monastery or vihara may have been there for centuries and many of the householders are likely to be related to those in the monastery who will be sons, brothers, uncles’s, fathers or grandfathers. The lay people carry bowls of steamed rice and vegetables which they reverently spoon into the alms bowls. Avoidin direct eye contact the monastics then carry this food back to the vihara where it is shared out strictly in order of seniority and eaten in silence before noon. After that time no monastic may eat again until the next morning. No cooked food may be stored overnight. On special occasions the householders come to the monastery, bringing with them an elaborate feast to offer the monks and share among themselves, but this too is done before noon. The bowl then plays a central part in the culture and system of training the Buddha introduced into the India of his time some four hundred years before Jesus. He set up a two-tiered community consisting of householders and monastics. The householders or lay supporters take it upon themselves to follow five basic moral precepts (respect for life, respect for property, honest and calm speech, responsible and loyal sexual behaviour, refraining from intoxicant misuse) and to support the Sangha or monastic community. The Sangha.s role is to embody the Buddha’s teaching by devoting themselves to the cleansing of the mind by following the extremely detailed system of spiritual and moral training that he set out within his long life-time that in known as the Vinaya. The Buddha’s analysis is that human misery is caused by the relentless and unbalanced cravings we are all, to a greater or lesser extent, subject to. He saw we have a tendency to fall into a variety of addictive patterns of behaviour, and his system of training is aimed at breaking the power of these patterns, negative feelings and misperceptions about ourselves and the world we live in, that is our greeds, our hatreds and our delusions. It aims at replacing these destructive tendencies with equanimity, compassion, generosity, moral responsibility, wisdom, insight. In this system of training then, where all forms of greed are seen as hindrances, the giving and consumption of food plays an important part. No food is of itself proscribed, even meat, for though the Buddha laid down in the Vinaya that no monastic should knowingly kill any sentient being, he refused to lay upon them strict vegetarianism, saying they should accept meat as alms food provided the animal had not been specially killed just to feed them. Rather they should accept with gratitude the generosity of those who support them. The Buddha pointed out that the first step towards becoming a better person, is to practice generosity and putting food into the almsbowl is one way for the lay person to do that. For poor subsistence farmers this can be quite a test. For the monastic the almsbowl also provides a tough training. Never being sure what, how much or how good the next meal may be is as much a mental test as a physical one and can be very difficult to bear with “serene equanimity”, but facing up to such feelings as arise is what the training is all about. Being aware of the real generosity and self-sacrifice of those who support the Sangha also leads the monastic to feel thankfulness and is a spur to more dedicated practice so as to be worthy of that generosity. Written as if I had been to Thailand – which I have not, but as a result of talking to Bhikkhus, monastics and lay supporters who have. My aim to help people understand the central role of Dana, generosity, giving – to the Sangha. It is this that makes the Buddhist community possible and signals a general attidude to life and possessions.